If you like your Blizzard Lighting Pipeline™ and wished it could become wireless - your dreams have come true. The Skyline™ is here Not only does this splitter give you the ability to plug in up to 8 DMX-Out from one DMX-In but also the ability to have Blizzard's Skywire™ fixtures in the mix as well. With so many entertainers using multiple LED fixtures and video mapping there are many occasions that will require the user to need many output to make fixture placement on their lighting rig easier. 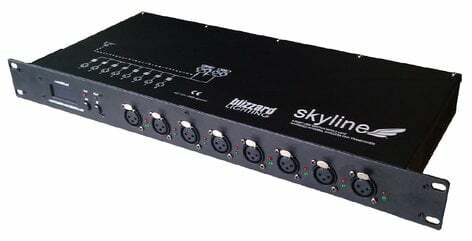 It’s important to have fast DMX response and proper DMX cabling management, and the Skyline™ will do just that. It not only provides instant response, but also a lower interference rate. The Skyline™ will allow you to increase the number of DMX outputs on your rig as well as add-in any of Blizzard's Skywire ability fixtures. It can also be used as a DMX transmitter itself and as repeater.